Squash blossoms have been all over the Bay Area farmer’s markets lately, so when I saw some beauties by the Ferry building this weekend, what else could I do but scoop some up and bake them in a frittata with ricotta and goat’s cheese? Any logical person would have done the same, I think. Now, I realize that there are those of you who are perfectly logical, thank-you-very-much, but who perhaps haven’t yet come across a squash blossom at the market or in the kitchen, and maybe wouldn’t even know what to do with one if you saw it, and so to you, Miss or Mister logical-but-squash-blossom-less, I say: that’s okay. Here’s the deal: squash blossoms are the dainty and edible flowers of young summer squashes (usually zucchini). They are bright orange, tinged with green, and sold at farmer’s markets alongside (and sometimes attached to) fresh, tender little squishes. Squashes. Squash. Squash blossoms are usually stuffed with cheese and fried, which is a perfectly amazing way to enjoy them, but they can also be steamed or baked and thrown into soup, salad or pasta. 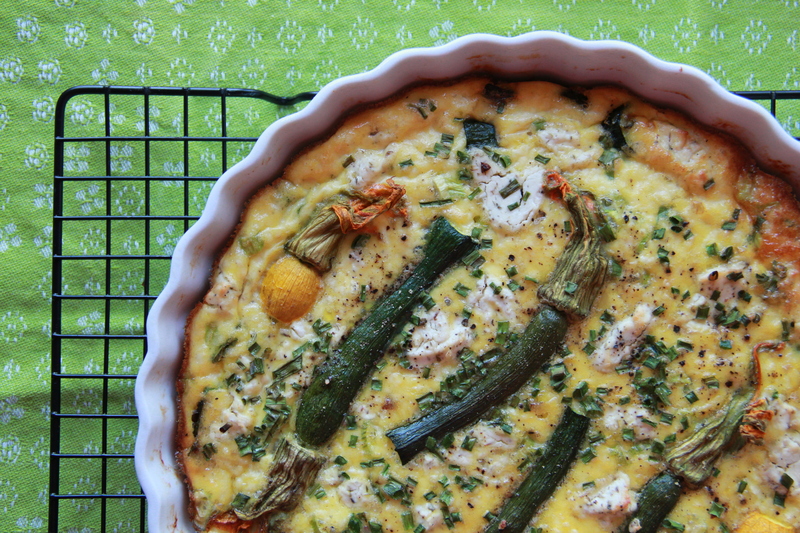 Or you could bake some in a fabulously herby frittata with ricotta and goat’s cheese. Entirely up to you. (I’d go with the frittata). (But really, it’s up to you). Heat your oven to 375 degrees F. Grease a 9-inch pie dish with butter or cooking spray. Place a medium saucepan over medium-high heat, and coat the bottom with olive oil. Sauté the shallots and zucchini with some salt and pepper until softened and lightly browned, about 7 minutes. Transfer the sautéed veggies to the prepared pie dish and arrange them on the bottom in an even layer. Sprinkle the scallions on top. In a large bowl, whisk together the eggs, ricotta, and a few big pinches of salt and pepper. Carefully pour the egg mixture on top of the sautéed vegetables and scallions, making sure to reach each “corner” of the pie dish. 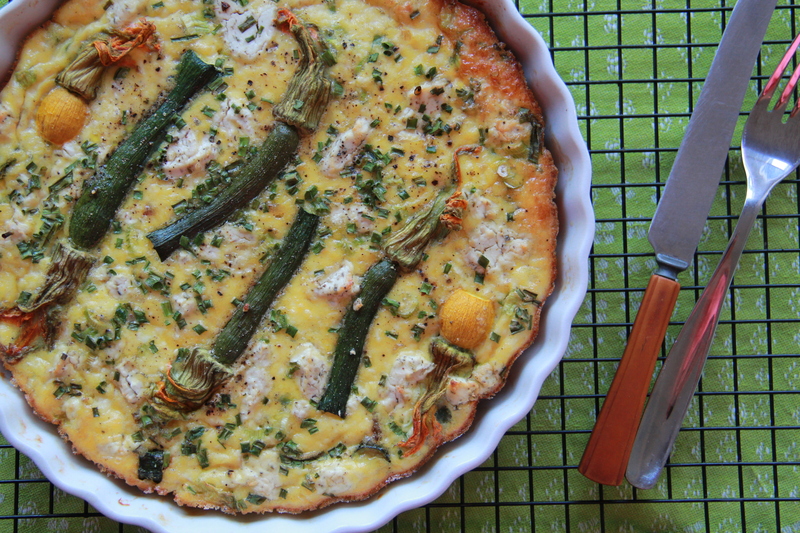 Arrange squash blossoms atop eggs, and scatter crumbled goat cheese around the blossoms. Sprinkle chopped chives on top of it all, and finish with one last pinch of salt and cracked black pepper. Place the pie dish on a larger sheet pan and bake the frittata for 25-30 minutes, until completely set in the center and starting to brown at the edges. Allow to cool before slicing into wedges and serving, either warm or at room temperature. 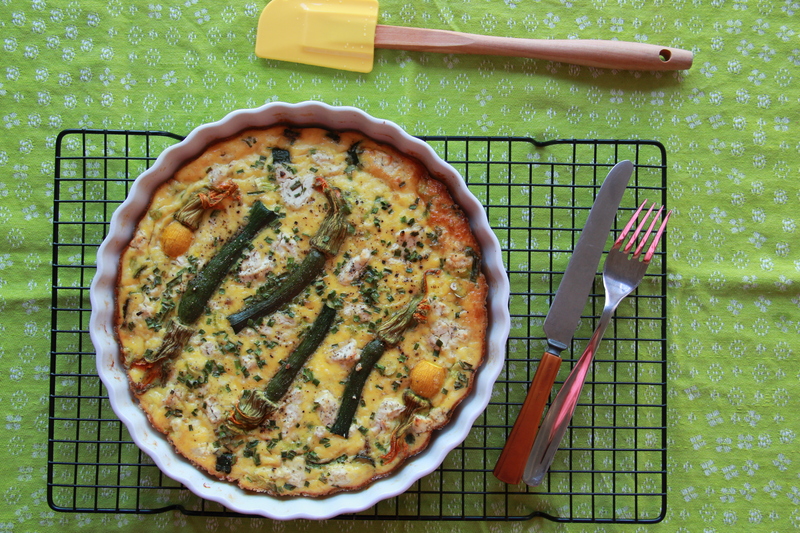 Makes one 9-inch round frittata (serves 6-8). These posts keep getting prettier! I <3 your frittatas! So, I don’t have access to squash blossoms… (I tried to grow some once, but that was a flop) Anyway, could I possibly do without? Anything you might recommend to substitute with? Hi Sophie! If you can’t find squash blossoms, I think chive flowers/blossoms would be a lovely substitute, if those are available to you. If edible flowers are out entirely, I’d probably just add some extra summer squash, slicing it in rounds and arranging it prettily on top. Either way, let me know how it goes!